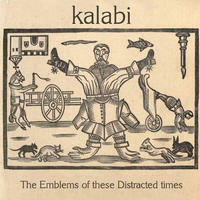 Kalabi : The Emblems of These Distracted Times. The Emblems of these Distracted Times sees Kalabi combining ambient and big beat styles to produce a interesting danceable style of chill out. The warm bass and layered atmospheres that are a signature of Kalabi's work are still here of course, but this time around the tempo wanders into the heady heights of 160bpm at times.